The Chargers announced Friday they have received another 24-hour extension to sell enough tickets to lift the TV blackout for Sunday’s game against the Kansas City Chiefs. The club has until 1:05 p.m. Saturday to sell the remaining 1,350 tickets. The Chargers have a streak of 44 consecutive regular-season and postseason games shown on local TV. The last blackout was Nov. 7, 2004 against New Orleans. 11-27 Update – We’ll update again at 1:06PM after the announcement has been made. The expected 24-hour extension was granted yesterday, pushing the deadline to 1:05 p.m. today for the Chargers to sell more than 3,000 tickets and get the blackout lifted for the CBS telecast. SAN DIEGO – Chargers players’ ticket orders were processed yesterday, significantly dropping the number needed to be sold to avoid a local television blackout. Still, about 3,500 tickets remain for Sunday’s game against the Kansas City Chiefs to be considered a sellout. If those tickets are not sold by today (or, more likely, tomorrow) at 1:05 p.m., a Chargers regular-season game will not be on local TV for the first time since Nov. 7, 2004. “Waiting and seeing,” is all Chargers COO Jim Steeg would say yesterday. Even if the Chargers receive the expected 24-hour extension, likely to be granted due to the Thanksgiving holiday, this is by far the most tickets remaining this late in the week. Steeg estimated there were 1,500 left the Wednesday before the home opener. In some ways this game was set up to be the biggest draw of the season, as it is a celebration of the team’s all-time 50 greatest players (plus three coaches). Of the 49 living players and coaches, 43 are expected to participate in the pregame ceremony. Junior Seau (Patriots) and John Carney (Saints) are still playing, Gill Byrd is coaching (Bears) and Rodney Harrison works for NBC on “Sunday Night Football.” Willie Buchanon and Bobby Ross are unable to attend due to personal reasons. There are approximately 7,000 seats available for Sunday’s game against the Chiefs Nov. 29th. 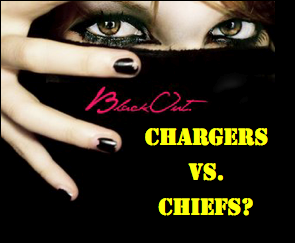 This is the first time in a long time the Chargers have faced a legitimate blackout possibility. The Chiefs are not a good team this year and got destroyed by the Chargers in Kansas City on Oct. 25th. That being said, neither of these teams are the same now as they were then. The Chargers were 2-3 last time they played and are now 7-3 after a five game win streak. The Chiefs released problematic running back, Larry Johnson two weeks ago and just defeated the World Champion Steelers in OT yesterday by a score of 27-24. I think the Chargers will be heavily favored in this match-up, but there is no predicting what can happen on any given Sunday in the NFL.